Introducing handSteady: a ground breaking drinking aid changing the way people are drinking. It stops spills, saves time and money, and makes drinking enjoyable again. Are you sick and tired of finding normal cups difficult to use? Does it seem like no matter what you try - or how much you spend - you NEVER seem to stop feeling anxious when holding a cup? ... and start feeling confident, dignified, relaxed and in control! Hello, my name is Chris Peacock, and I’m the Director of handSteady Ltd, a company specializing in helping people to drink easier without losing their dignity by making and distributing handSteady cups. Since 2012, we've helped many people drink easier. handSteady is patented and promoted by leading healthcare professionals and organisations including Parkinson’s UK, Tremor Action Network and the National Tremor Foundation. It has won awards from Lord Snowdon, Dyson and Help the Aged. I was inspired to create a solution for drinking difficulties when one of my closet family members started having a hand tremor. This made holding a cup tricky. So I started thinking up ideas whist in London at the Royal College of Art doing a product design masters course. It became clear that normal cups can be hard to use due to the handle being fixed in a single position. 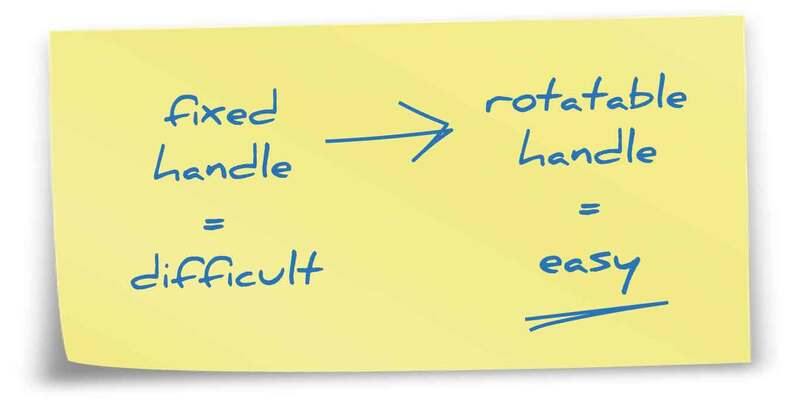 So, I created the concept of enabling the handle to rotate smoothly about 360 degrees. A variety of people tested this, and the results were staggering. Not only did it help people with tremor in unique new ways, but also people with limited range of motion, muscle weakness and wrist and finger pain. I then developed, tested and refined the design with 35 health experts and 72 people with health conditions. Finally, all the hard work paid off! We made carefully crafted changes to the design of drinking cups to bring back the joy of drinking in new ways that would be impossible to achieve any other way. 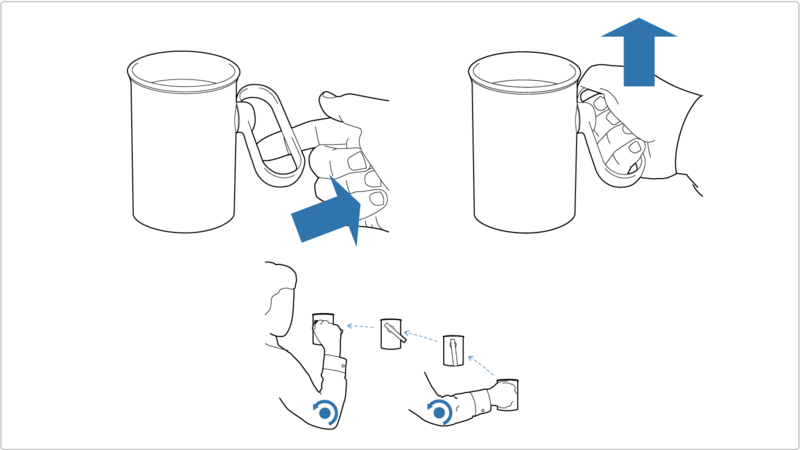 This ground breaking device that is changing the way people drink with less spills, more control and more comfort is called handSteady® - which is a cup with a unique Rotatable Handle™ and Hidden Lid™. handSteady® is designed to help you drink with dignity by looking as normal as possible. You simply start using handSteady® cups, and within a day or so you're likely to notice that you no longer have the difficulties with cups that may have been part of your life for so long. Unlike other cups, the handle on handSteady can smoothly rotate 360 degrees. In a moment you'll see how it works. 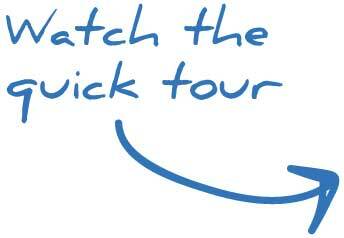 ... you can then tilt it with more control by pivoting it with your mouth, hand or thumb. The handle also allows you to drink without bending your wrist, lifting your elbow or leaning your head back as far. The Hidden Lid sits on the rim of the handSteady cup and is discreet to preserve your dignity. and has an inclined surface to return drops into the cup. 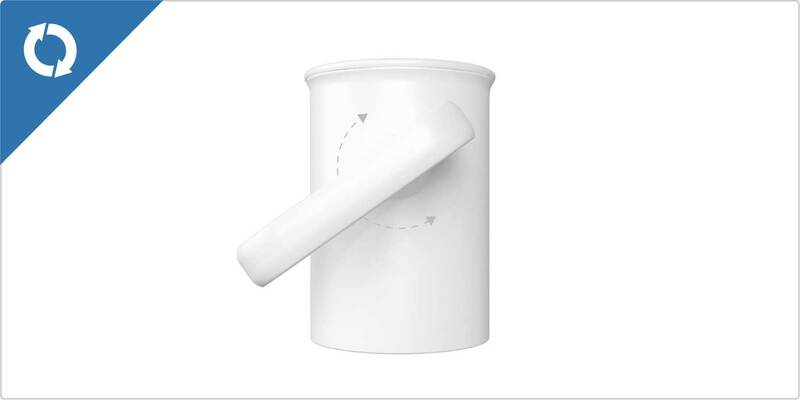 It is easy to insert and remove - just push onto your cup in the desired position to insert, then push up to remove. The cups are approximately 30% lighter than normal china cups, weighing just 4.5 oz. (103g). 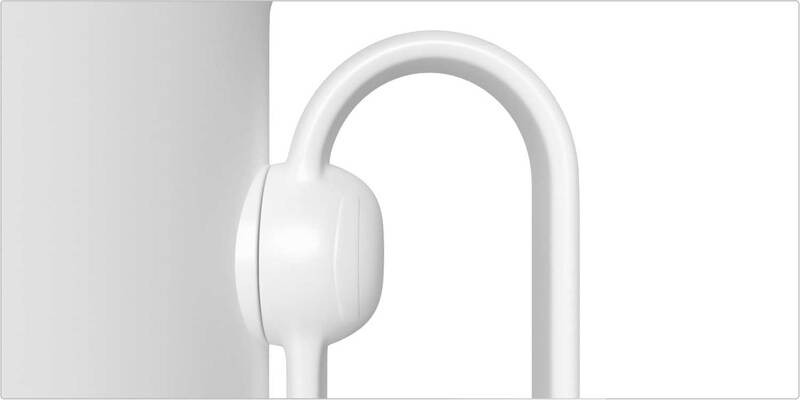 The handle is also designed to not stick out to far from the cup, which also makes it feel light weight. As such, you’ll find handSteady cups is easier to lift if you have weakness and joint pain - saving you energy. handSteady is made from BPA free polypropylene plastic making it microwave safe, dishwasher safe and break proof. This makes it easy heat up drinks and keep the cup clean, and stops the cups from breaking if dropped. It’s also sterlizable, in autoclave machines, and stains can be removed by placing a tea spoon of biocarbonate of soda with water in the cup and leaving for a few hours. The handle is large enough for up to 4 fingers. 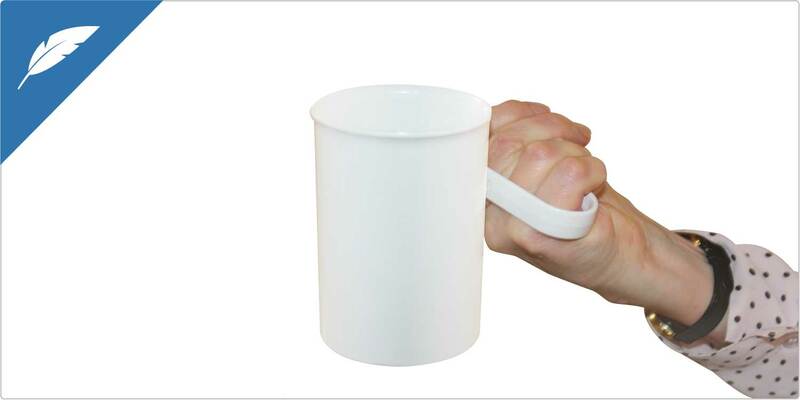 This allows the weight of the drink to be spread cross the hand and fingers to reduce pressure and discomfort. ... or, the ‘power grip’ hold with a clenched fist, which reduces the chances of you dropping the cup. Whilst handSteady is made from plastic, it is color matched and designed to look like a fine bone china coffee mug, making it suitable for many environments, such as restaurants and cafes. It is a normal size of 8.5 fl oz (250 ml), which is ideal for coffee machines. The inside of the cup is slightly inclined, which helps with not needing to lify your head back as far. 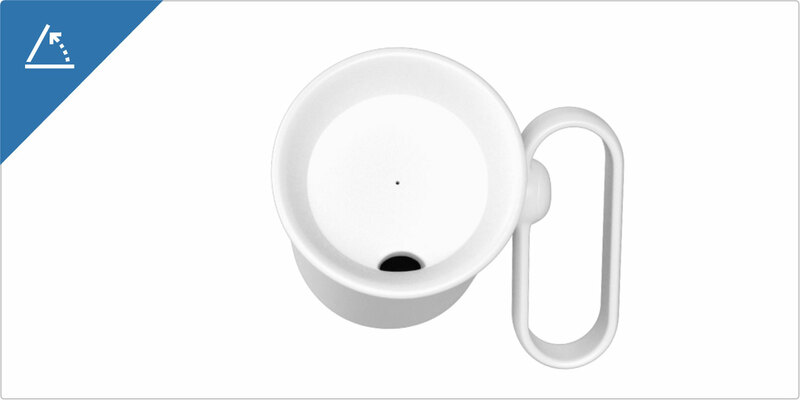 It has a thin Curved Rim to feel elegant when drinking and reduce the chances of ugly drip stains outside of the cup. The scientific breakthrough in handSteady® is the Rotatable Handle™, which smoothly rotates 360° thanks to two ball bearings inside a low friction mechanism in the handle. This makes drinking easier in unique ways. Whilst the Rotatable Handle™ can seem counter intuitive at first, it doesn’t take long before it feels completely natural to use. Tilt the handle to make it easy to pick up, hold the handle at any angle and the cup stays upright, and bring the cup to your mouth without needing to bend your wrist. 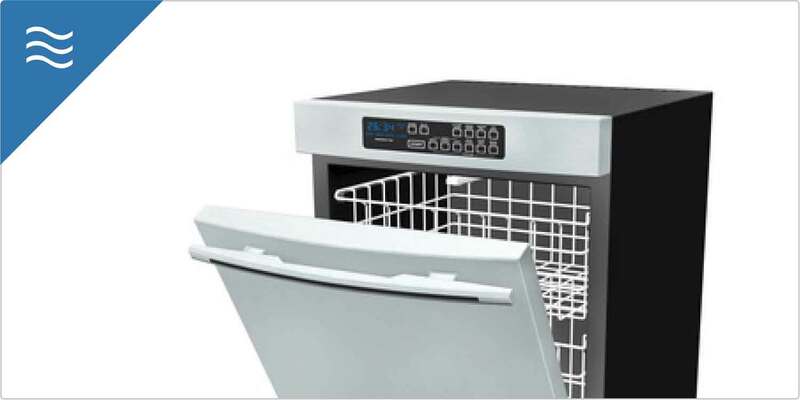 The Rotatable Handle™ frees the cup to stay upright and self-level using gravity. This reduces the chances of spills, frees you to hold the handle in comfortable and stable positions and frees you to use one hand rather than two if you have weak wrists. As shown in the diagrams, to lift the handSteady® cup - start by tilting the Rotatable Handle™ to make it easy to pick. Then as you clasp the handle and lift up, hold the handle at any comfortable angle. You can then bring it to your mouth without needing to bend your wrist, which is ideal if you can’t bend your wrist or if you have wrist pain. As a bonus, you can also grasp the handle with the back of your hand when it’s on a side table, and bring it to your mouth without needing to twisting your body - which is ideal if you have restricted motion or have limited energy. 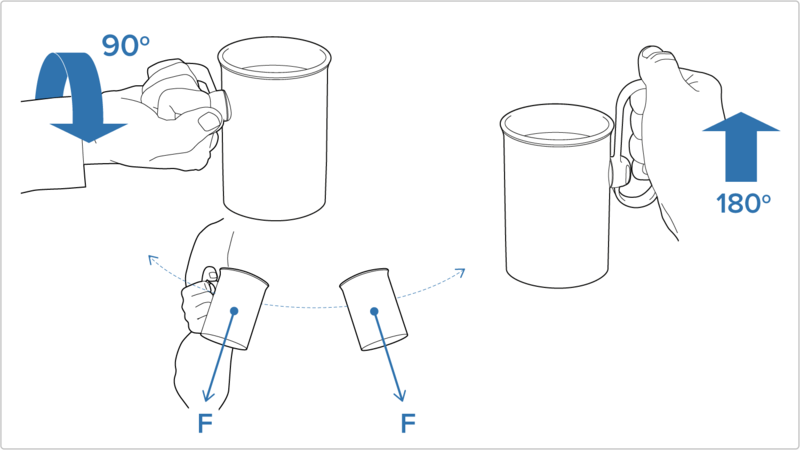 The cup tilts for drinking easily by pivoting the cup with your mouth, other hand or thumb. You can also tilt it like a normal cup by fixing the cup using your thumb. You can easily tilt handSteady® cups to drink with more comfort without needing to bend your wrist, raise your elbow or lift your head back as far. using your mouth - either bowing your head or pushing your mouth into the cup, or by placing your mouth on the rim of the cup and lifting the handle. using your thumb - either pressing your thumb on the rim or side of the cup with your thumb. using your other hand - either clasping the cup and tilting the cup, or pushing the base of the cup outward. This gives you more control as you can take the weight of the cup in the hand holding handle, and control the tilting with your other hand. You can also fix the cup in place with your thumb and tilt the cup like a normal cup. However, by being able to tilt the cup easily, means you it’s easier to drink if you are drinking with your chin on your chest and you don’t have to sit up as far when drinking in bed. The Rotatable Handle™ also makes the cup ideal as a feeder cup, as your helper can hold the cup near the mouth and you or they can control the tilt. handSteady® cups are designed to be more steady in a several ways if you have tremor or reduced coordination. This reduces spills, saving time and money, reducing anxiety and increasing control, well-being, confidence, independence, inner peace and dignity. 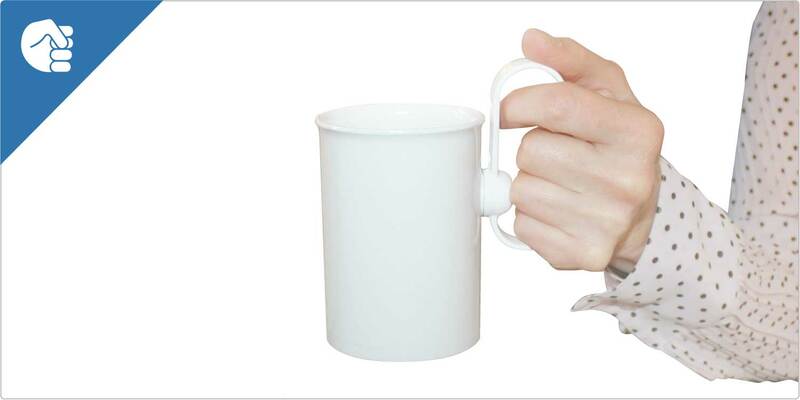 hold the cup with two hands - which reduces the effect of tremor in the hand holding the handle on the cup. let the cup swing freely - such as when walking or with dyskinesia - and centrifugal force will keep your drink in the cup. anchor your elbows - such as placing and keeping your elbows on a table, arm of a chair or by your side for stability throughout the drinking process. easier and no prescription is required! Healthcare professionals all over the world recommend handSteady cups to their patients. 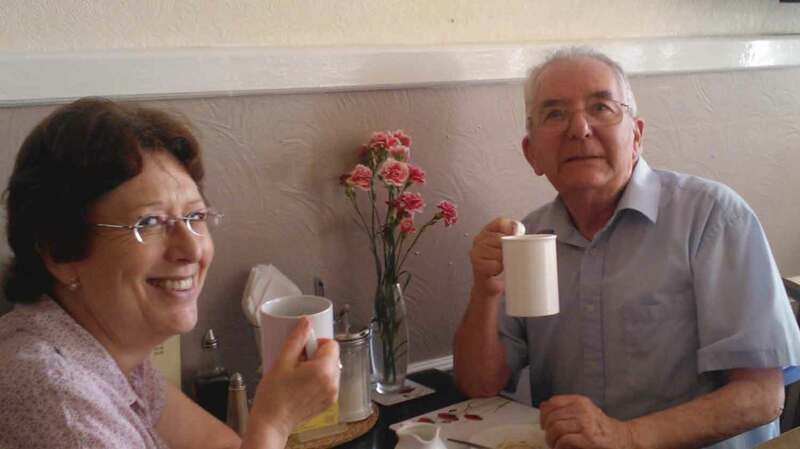 It’s a best selling product in Parkinson’s UK’s Daily Living Aids catalogue, who say the cup “... can make easily enjoying cup of tea a reality once again for people with Parkinson’s”. Will handSteady work for you? Some people use the cups just some of the time such as when their symptoms are worse or when they’re travelling. Whilst others find them so helpful that they use them all the time! Jackie has had tremor for 39 years. In the past her cups would shake with her tremor, which resulted in spillages, especially when walking from the kitchen to the living room. Now, with handSteady, she holds the handle at an angle where her tremor is less and spills are a thing of the past. 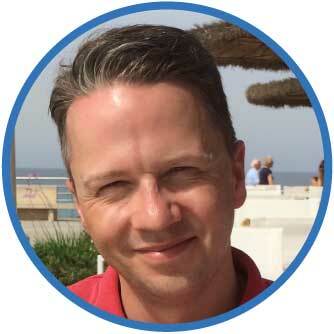 John has muscle weakness due to Multiple Sclerosis. In the past John would need to put a lot of effort into holding his cups upright and manipulating with both hands as he brings it to his mouth. Now, with handSteady, John can drink more easily without and more easily control the liquid flow when drinking. 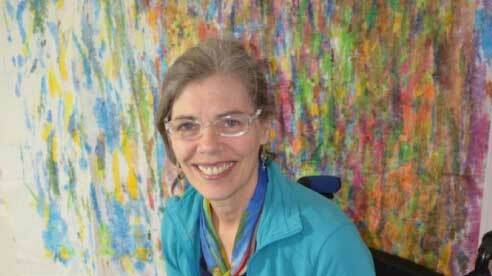 Kate has dyskinesia due to Parkinson’s. In the past Kate would have frequent spillages resulting in time being spent cleaning. handSteady cups enabled Kate to drink without spilling, as she allowed the cup to move with the swinging motion of dyskinesia and centrifugal force kept the drink in the cup. 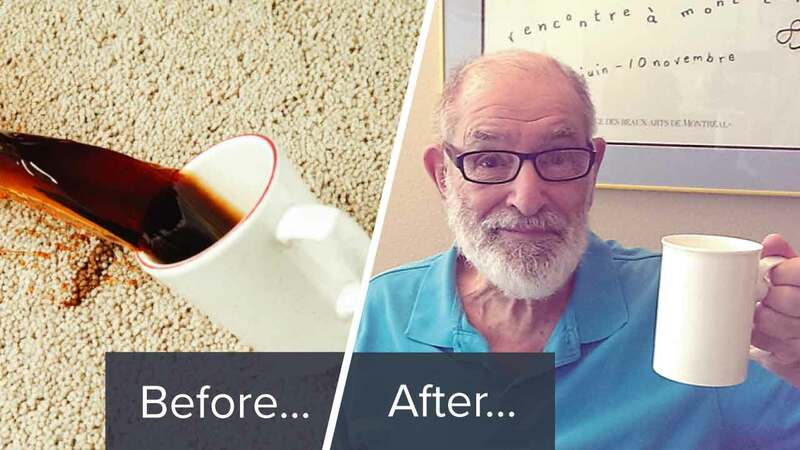 "... not spilt a drop of coffee since he's had it"
Jan Wright said, "I bought this mug for my father as his hand tremors were getting worse and he was getting embarrassed about always spilling his coffee when we went out." “We have now taken it to about five difference cafes and everyone has been happy to give him his drink in it. "... decrease pain... more confident"
Anne Cammozzi said, "The handSteady cup makes such a huge improvement in the quality and ease of my life, I can't stop talking about it." 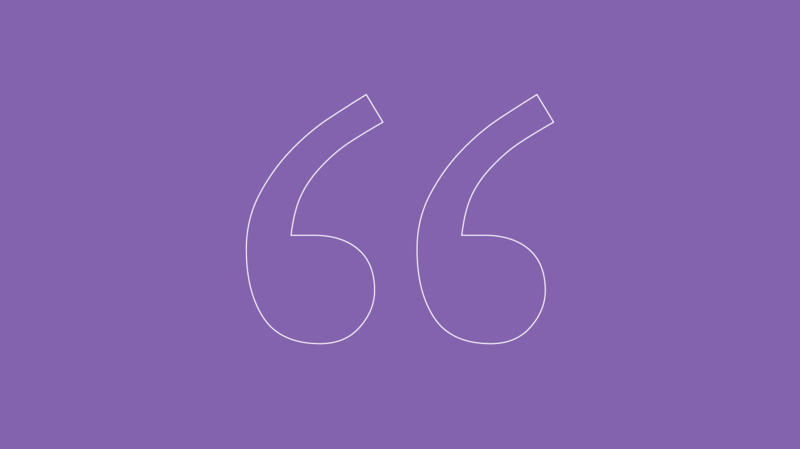 "... tremor in his hand... no more spillages"
Louise said, "handSteady was purchased for my grandfather who has tremor in his hand which is is very conscious of." “Whilst he was not thrilled with the thought of using a different cup from everyone else, he is now thrilled with the ease of drinking this cup has provided him." ... you may consider the value of drinking to be priceless. So, even though the cost to make handSteady is subsantial, we’ve worked hard to make it available for as low as possible so as many people can benefit from it. It’s now available for just £15 plus shipping. This equates to just £1.25 per month over a year to be FREE of difficulties with cups that may have been making your life so unpleasant for so long. I understand you could have tried many products only to be disappointed time and again. So you may be uncertain if handSteady will be any different. ... and see for yourself if handSteady cups make drinking easier for you. ... we’ll then instantly process a full 100% refund. Are you ready to put an END to your difficulties cups once and for all?! To wake up in the morning knowing your day will be completely FREE of difficulties with cups and spilling drinks that may have been plaguing you... possibly for years? Order your handSteady cups right away and in just days you can be drinking easier once again with more control, comfort, independence and dignity. 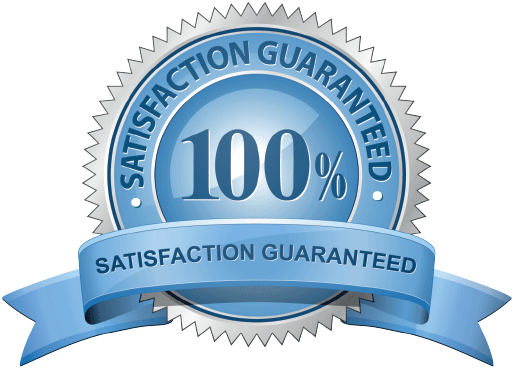 And remember, you're fully covered 100% money back guarantee, so you’ve got NOTHING to lose giving handSteady a try. Nothing but your difficulties with cups that is. To get started with handSteady cups right now, simply follow the link below. 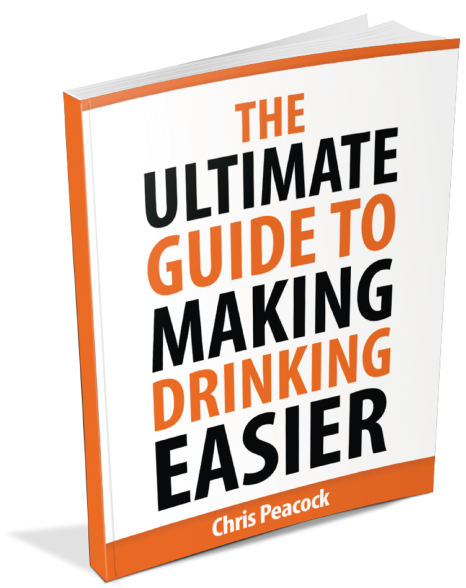 I look forward to helping you drink easier. Everything you need to know about drinking easier with handSteady cups! Many people think it’s impossible to truly make drinking easier due to their health condition. Discover how the handSteady ground breaking device is changing the way people drink to make drinking enjoyable again.